Rome, Jun 22 (Just News): Italy said it will seize two migrant rescue ships in the Mediterranean, amid a deepening row over migrants. Two German NGO ships carrying migrants "will be seized" to determine their legal status. The move comes as French President Emmanuel Macron attacked the "leprosy" of anti-EU feeling, angering Italy's new populist government. Italy sparked the fresh row earlier this month when it refused to take in the Aquarius rescue ship. Carrying 630 migrants rescued off the North African coast, the ship eventually sailed to Spain after being turned away by both Italy and Malta. Leaders from 10 EU member states will meet in Brussels on Sunday to discuss how best to stem the flow of migrants to the bloc. The Italian government earlier said it will not sign up to any EU plan unless it makes helping Italy a priority, while Poland, the Czech Republic, Slovakia and Hungary - known as the Visegrad Group - said they will boycott the talks. The UN refugee agency on Thursday said it was "shocked and saddened" by the recent drowning of 220 people off the coast of Libya, and called for urgent action. Relations will be further strained after President Macron's comments. In a speech in Brittany, Mr Macron said anti-EU feeling was rising "a bit like a leprosy all across Europe", including in "neighbouring countries" - without specifically naming any one nation. "They're saying the worst things, and we're getting used to it," he said. Deputy Italian prime minister and leader of the populist Five Star movement Luigi Di Maio tweeted in Italian that Mr Macron's words were "offensive and misplaced", saying that "true leprosy" is when countries turn back migrants and then "preach to us" about calls for them to redistributed to other EU states. The two ships, Lifeline and Seesuchs, belong to the German body Mission Lifeline. 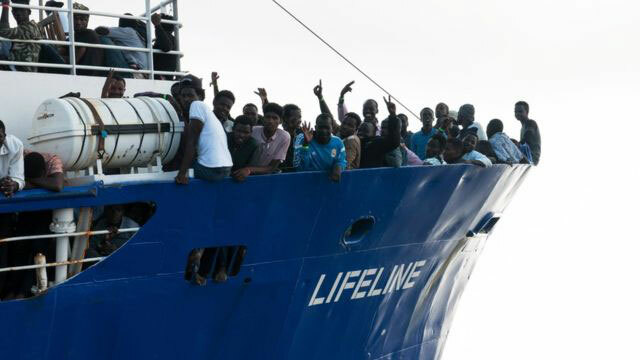 According to the NGO, Lifeline rescued 224 migrants off the coast of Libya on Thursday morning. Italy's interior minister and leader of the right-wing League party, Matteo Salvini, said on Facebook the ship should "go to Holland", as it was said to be flying under a Dutch flag, and should not dock in Italy. However, the Dutch delegation to the EU later clarified in a tweet that the ships are not registered in the Netherlands, and not flying under its flag. Italy's Infrastructure Minister Danilo Toninelli later said the ship broke the law by taking the migrants even though the Libyan coastguard had already intervened. He said Italy would seize both the Lifeline and the Seesuchs to determine their legal status, and said Italy would "once again save the migrants". Mission Lifeline later posted an image on Twitter of a registration document they say proves the ships sail under the Dutch flag. Why the tough words from Italy? Italy's new coalition government wants to deport half a million undocumented migrants, many of whom are housed in squalid reception centres. More than 600,000 have reached Italy from Libya in the past four years. Speaking on Italy's Rai national TV, Mr Salvini said it was "unacceptable" to be told "we will help you in one or two years, while you keep those who arrive and we will send you others". Italian Prime Minister Giuseppe Conte says measures to curb the flow of migrants to Italy from North Africa are the priority - not transfers of migrants from one EU country to another. Among them are refugees from the war in Syria or other conflicts, who generally have a right to asylum. Why doesn't the EU stop the boats coming? Italian warships are spearheading Operation Sophia, an EU anti-smuggler mission patrolling a vast area off the Libyan coast. The EU has stepped up co-operation with the Libyan coastguard to intercept migrant boats. But people-smuggling gangs have flourished in Libya's chaos, charging desperate migrants thousands of dollars per head. The EU Commission has proposed "regional disembarkation platforms" in North Africa, where the UN and other agencies could screen those who have a genuine claim to asylum in Europe. Those not eligible would be offered help to resettle in their home countries. But processing centres outside the EU must not become a "Guantanamo Bay" for migrants, EU Migration Commissioner Dimitris Avramopoulos warned. The EU also aims to increase its Frontex border guard force to 10,000 staff by the end of 2020. The EU's controversial Dublin Regulation states that an asylum seeker's claim should usually be handled by the country where she or he first arrives.